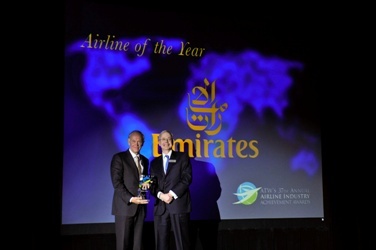 Emirates, the Dubai-based carrier, was honoured by leading industry title Air Transport World last night (Tuesday, February 8) as the airline's President Tim Clark received the 'Airline of the Year' award at a gala dinner in Washington, D.C.
"The last few years have been among the most demanding in our industry's history but despite the challenges, we have kept our focus on delivering the very highest standards of product, passenger comfort and operational efficiency," said Tim Clark. "This recognition is testament to our commitment to innovation and service excellence as we continue to grow our global network and offer customers more opportunities to discover the world from Dubai." "Customers have a choice to fly Emirates, given that more than 125 airlines serve Dubai. The route network appeals to travelers not only in the UAE, but to those in Europe, Asia, Africa and North America who value the efficiency and connectivity of the Dubai hub," said Perry Flint, Editorial Director for ATW. "A cornerstone of EK's success has been a relentless drive for cabin innovation not just in premium class but in economy," added Flint. "The decision to award Emirates 'Airline of the Year' is in recognition for its strong commitment to safety and operational excellence, its trendsetting customer service and its superb financial performance including a 22-year consecutive annual profit streak." Since launching services in 1985, Emirates has grown into one of the largest and most dynamic airlines in the world, transforming Dubai into a world-class hub for global air travel. The airline is a leader in developing flexible air routings that save fuel and reduce CO2 emissions. These advances, combined with a host of other achievements have resulted in more than 400 international awards recognizing the airline in almost every category. Some of Emirates' pioneering innovations include becoming the first airline to introduce individual seat back videos and to enable passengers to make authorized onboard mobile phone calls. Emirates' flagship A380s are the only commercial aircraft to feature onboard shower spas for first class passengers. The airline has experienced rapid and consistent growth, above 20 per cent a year on average. Financially self-sustained and unprotected, Emirates carried 27.5 million passengers in the 2009-10 financial year - almost 4.7 million more than the previous 12 months. Emirates currently flies to 110 cities in 66 countries across Europe, North America, South America, the Middle East, Africa, the Indian subcontinent and Asia-Pacific. So far this year, the airline has launched a new route to Basra, Iraq on 2 February and will start new services to Geneva on 1 June and Copenhagen on 1 August.